If you're ever beset by a strange and distinct feeling that you can't quite name, you're not alone. 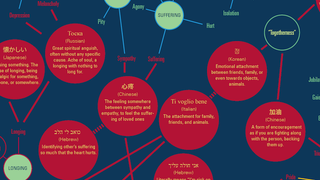 Just as the English language has pulled in loanwords like "schadenfreude" to name emotions with no English equivalent, there are a number of words other languages use to describe emotions still unnamed in English. Designer Pei-Ying Lin has charted a handful of these emotions, which are ready for your linguistic consideration. After receiving her undergraduate degree in life science, Lin received her masters in design interactions from London's Royal College of Art, and much of her work deals with the intersection between art, science, and communication. One of her Unspeakableness, an exploration of trans-language communication and emotional language. For one portion of the project, "The Untranslatable Words," Lin asked colleagues for emotional words from various languages that have no English equivalent. Then, using W. Gerrod Parrott's classification of human emotions as a starting point, Lin attempted to chart these complex emotions, giving English speakers a sense of where they fit with more familiar emotional words, using named emotions to explain unnamed ones. In addition to this chart, Lin has also created a somewhat funnier "New emotions invented by the Internet" chart using a similar approach. These emotions may not have names in any language just yet, but they're all too familiar all the same.